We accept monetary and other asset based donations to support our operations and long term plans. Cash donations support our everyday operations. They enable us to purchase archival materials to preserve artifacts, cases to exhibit items and much more. Every physical donation we receive has a cost associated with it as these historical artifacts go through a multi-step process when they are received and then become available for public viewing. Please support our ongoing operations. Our website hosting and infrastructure are recurring costs and those are exploding. This includes the many domain names and nearly 50 websites we own and operate. With the dramatic expansion of our online database and library we forecast that our monthly IT costs are expanding rapidly. We have tremendous plans for continued expansion of the data material we bring to the public without fees for use or access. We welcome your assistance in this area. Our STEM-HG based programs need $100,000 to create an online learning section and the first batches of learning videos that can be subscribed by schools. This is the first step of our new 2018 STEM-HG initiative. We are also accepting cash and other assets to support our capital campaign to fund the construction of our world class campus. We have a large scale plan and we hope you will be part of this project. Research center, exhibit space, classrooms and much more are in our plans. Monetary donations can be in the form of checks or credit cards. Credit card donations use the 'donate' link below. Contact us to mail checks. We do accept non-monetary based donations. Please contact us to discuss. If you would like to make a donation with a credit card you can do so via our online partner, Paypal. Click the Donate button below for a secure credit card donation screen. 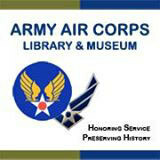 The Army Air Corps Library and Museum is a 501(c)(3) Non-profit, your qualifying donations are tax deductible. Rather Call Us? Contact Our Executive Director On His Cell Phone. (214) 957-1393. Thank you for helping us preserve and honor this special history.